Do the words ‘api-ms-win-crt-runtime-l1-1-0.dll missing’ ring a bell? You will mostly see this while launching a program on your Windows computer as an error message The program can’t start because api-ms-win-crt-runtime-l1-1-0.dll is missing from your computer. This error either means that Universal CRT, which is part of the Visual C++ Redistributable has either failed to install properly or that the api-ms-win-crt-runtime-l1-1-0.dll file has become corrupted or gone missing. You may receive this error when trying to open some Adobe applications, SmartFTP software, Skype, Microsoft Office, and so on. Make sure that you update your Windows. Run Windows Update and confirm. Run the System File Checker to replace potentially corrupted system files. You can also reinstall the program that is causing this error. 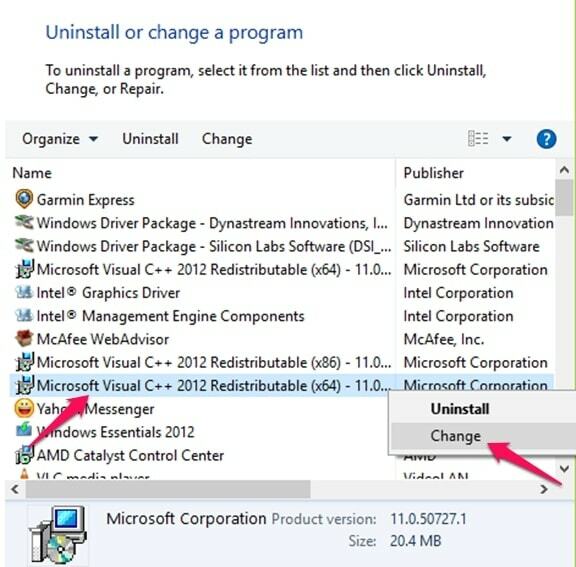 If you have already installed Visual C++ 2012 Redistributable package, but you still encounter the error, you might require to repair the program. Open Control Panel and go to Programs and Features section. Find out Microsoft Visual C++ 2012 Redistributable (x64) [for 64-bit machine], right-click on it and select Change. Click on the Repair button. Click Yes on the prompt by the User Account Control and follow the on-screen instructions to complete the repair. 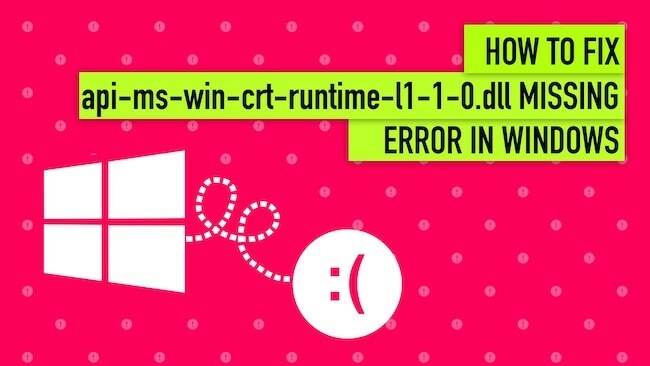 If the DLL file is present on your computer, but you continue to get the api-ms-win-crt-runtime-l1-1-0.dll missing error, you may need to re-register the DLL file. regsvr32 "path & filename of dll or ocx"
regsvr32 /u "path & filename of dll or ocx"
Run the built-in System File Checker tool to replace missing or corrupted operating system files. Press the Windows icon + R. Type cmd.exe into the window and press enter to launch the Command Prompt window. If you are running Windows 10, Windows 8.1 or Windows 8, first run the Deployment Image Servicing and Management (DISM) tool prior to running the System File Checker. Type the following command, and then hit Enter. Run the DISM (Deployment Image Servicing and Management) tool and repair the Windows system image and fix a corrupted Windows Component Store. Press the Windows icon + X to open the Power User menu and choose Command Prompt (Admin). Repair or re-install the software if some application throws up this error. Copy the DLL file from another system and restore it on your PC, followed by re-registering the DLL file. If none of the above works for you, then as a last resort you can download the missing DLL file from the internet and use it. Although copy-pasting the downloaded file to a particular location is not an ideal solution, it might work. If the error is still not resolved, download the Update for Universal C Runtime from Microsoft. Install the Runtime component, restart your computer and check. Just remember that beginning with Windows 10, the Universal CRT is part of the operating system. If the solutions mentioned above do not help fix the api-ms-win-crt-runtime-l1-1-0.dll is missing error, you may require to install Microsoft Visual C++ Redistributable update from Microsoft. You need to choose the OS architecture, i.e. 32-bit or 64-bit. Like the Visual C++ 2012 Redistributable package, some programs use the Microsoft Visual C++ Redistributable for Visual Studio 2017 to fix the error. So you may need to install this one. You can find the package here. We hope the solutions mentioned above come to your rescue and help get you rid of the api-ms-win-crt-runtime-l1-1-0.dll missing error. Let us know which one of these worked for you or post your queries in the comment section below.